Airplane wings are designed to flex under load. 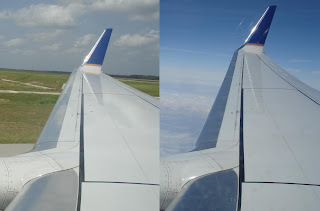 Pictured at left is the wing of a Boeing 737-900 at taxi, and in flight. I was very careful to frame the picture for a fair comparison. There are more extreme perspectives available - see the curvature of the wings of a Japan Airlines 747 at LAX.